Crowned with a record-setting horde of 29 satellites, a Minotaur 1 rocket bounded into space from Virginia on Tuesday night and put on an evening sky show before releasing the medley of spacecraft more than 300 miles above Earth. Liftoff of the Minotaur 1 rocket occurred at 8:15 p.m. EST (0115 GMT) from Wallops Island, Va. Credit: Orbital Sciences Corp. The 69-foot-tall booster raced off its launch pad on Virginia's Eastern Shore at 8:15 p.m. EST Tuesday (0115 GMT Wednesday), soaring past the speed of sound in less than 30 seconds and leaving a plume of rocket exhaust in its wake. 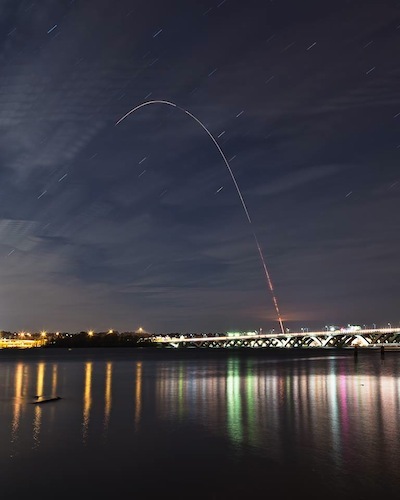 Sponsored by the U.S. Defense Department's Operationally Responsive Space office, the fiery launch from NASA's Wallops Flight Facility was delayed 45 minutes Tuesday evening as technicians resolved a problem with a downrange tracking station in North Carolina. Accompanied in the sky by a nearly full moon, the Minotaur rocket rapidly became a point of light visible from South Carolina to New England as it transited the Atlantic Ocean at more than 10,000 mph. The four-stage rocket is based on leftover solid-fueled motors from the U.S. Air Force's Minuteman missile program. Designers added two Orion motors on top of the Minuteman hardware to turn the bomb carriers into satellite launchers. The Minotaur's fourth stage burned out about 9 minutes after liftoff, and live commentary from the launch team indicated the rocket achieved the targeted orbit 310 miles above Earth with an inclination of 40.5 degrees. The successful launch marked the 11th flawless Minotaur 1 mission since the rocket entered service in 2000. Coupled with four space launches using the larger Minotaur 4 and 5 rockets based on the Peacekeeper missile, the Minotaur program has delivered 74 satellites to orbit on 15 flights, according to Orbital Sciences Corp., the Minotaur's commercial contractor. Tuesday's launch was the last Minotaur rocket flight on contract with Orbital Sciences, but the company is eligible to bid on future missions and officials expect more contract awards in the coming years. The largest of the mission's 29 payloads, a satellite named STPSat 3, separated from the rocket on schedule about 12 minutes into the mission, according to the launch team. Dubbed the ORS 3 or "enabler" mission, the Air Force arranged the launch to test automated trajectory targeting, an autonomous flight termination system and a commercial procurement process that officials said reduced the time and cost needed to get the mission off the ground. The autonomous flight termination system, provided by ATK, is designed to track the rocket's flight path with GPS navigation and destroy the vehicle if it veers off course. That job is currently done by a safety officer on the ground who sends a manual destruct command if something goes wrong. The autonomous destruct system for Tuesday's launch was in a passive mode, and someone was on station in the control center to push the flight termination button if necessary. "These enablers not only focus on the ability to execute a rapid call-up mission, but they also reduce engineering hours from months to days, resulting in decreased mission costs," said Jeff Welsh, ORS 3 mission director at Kirtland Air Force Base, N.M.
Tuesday's launch cost $28.8 million, a figure that includes the rocket, launch support and the integration of the 29 payloads, Welsh said. But the number does not include the cost of developing the individual satellites. The ORS office was set up as a trailblazer for the Air Force's space programs, which have struggled with cost overruns and delays. There is a push from Congress and from within the service to spread the military's space missions among a larger number of modest satellites, a strategy the Air Force calls "disaggregation." "It all depends on the mission and it depends on the subset of requirements that we can tackle with these types of capabilities - these CubeSats or nanosatellites - but they are factoring in the concepts we're evaluating as we go into the analysis of alternatives for a number of different mission areas, now and in the near future," said Col. Scott Beidleman, director of the development planning directorate at the Air Force's Space and Missile Systems Center. The White House's last two budget proposals have zeroed out funding for the ORS program, seeking to merge it with the rest of the Air Force's procurement office at the Space and Missile Systems Center. But Congress has balked at the idea so far, adding funding back to Operationally Responsive Space in budget negotiations. 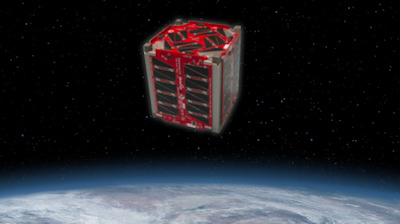 The experimental STPSat 3 satellite is about the size of a dorm room mini-refrigerator, according to the spacecraft's manufacturer, Ball Aerospace and Technologies Corp. of Boulder, Colo.
STPSat 3 hosts five sensors aimed at testing advanced satellite components and measuring plasma, the ionosphere and the amount of solar radiation hitting Earth's atmosphere. One of the $55 million STPSat 3 mission's instruments is a stopgap payload to continue a 35-year data record on the sun's total energy output, a measurement known as total solar irradiance. NASA's existing solar irradiance instruments are on aging satellites, and the next opportunity to fly a comparable sensor is not until 2016. "We're launching this one just in time to make sure there isn't a gap in this important measurement," said Ken Reese, the Air Force's STPSat 3 mission manager. Solar irradiance measurements are important to calibrate climate models, according to scientists. 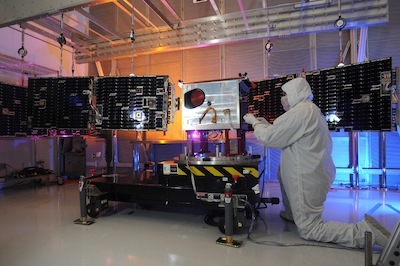 A joint project between NASA and NOAA, the solar energy monitor was rushed on the STPSat 3 mission after a launch failure doomed NASA's Glory climate satellite and its solar irradiance experiment in 2011. After releasing STPSat 3, the Minotaur rocket's upper stage maneuvered a safe distance away from the spacecraft before beginning the sequence to jettison 28 CubeSats that rode inside "wafers" during launch. The CubeSats included the first satellite ever built by high school students, a 2.2-pound device that features an amateur radio transmitter and a "Text Speak" module designed to convert text messages into an analog voice signal, according to the TJ3Sat satellite's website. TJ3Sat was assembled by more than 50 students over seven years at the Thomas Jefferson High School for Science and Technology in Alexandria, Va.
Other CubeSats on the mission included a smartphone-based demo satellite for NASA, a tactical military communications satellite, a miniature space debris tracker, and a slew of tiny spacecraft testing cameras and miniaturized components. 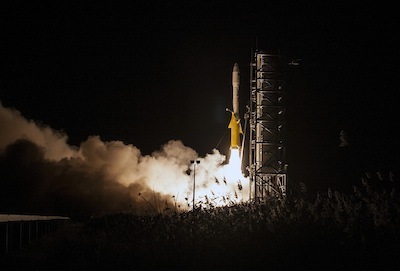 Check out a complete listing of the spacecraft launched Tuesday by the Minotaur 1 rocket. Artist's concept of TJ3Sat in orbit. Credit: Orbital Sciences Corp.
"Payloads were selected on a number of criteria," Welsh said in a conference call with reporters before the launch. "However, the main objective was to find payloads with military utility and/or relevancy." The deployment of the CubeSats occurred when the rocket was out of range of communications antennas on the ground, so the health of the satellites could not be verified late Tuesday. The operators of each satellite expected to receive their first signals some time Wednesday when they soar over ground stations. Johns Hopkins University issued a statement Tuesday night confirming two of its shoebox-sized CubeSats launched on the Minotaur radioed mission controllers, indicating the separation of the CubeSats was initiated as planned.